Dragons awake after 12 years sleep ! After 12 years of hibernation an old set of New Year Dragon prints awaken to wreak havoc upon a northern suburb of Chicago. 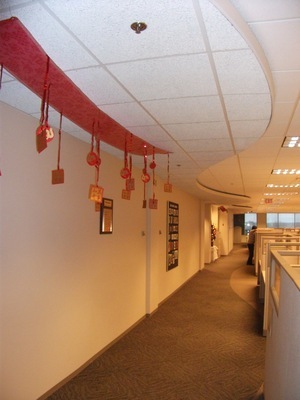 The prints were part of the original Baren Chinese New Year Dragon exchange of 2000 (Y2K). They were also part of a Baren exhibit at the Skokie Public Library and after that ran it's course the dragons were silenced until last month when they came out of hibernation to attend a New Year party at Walgreens headquarters. 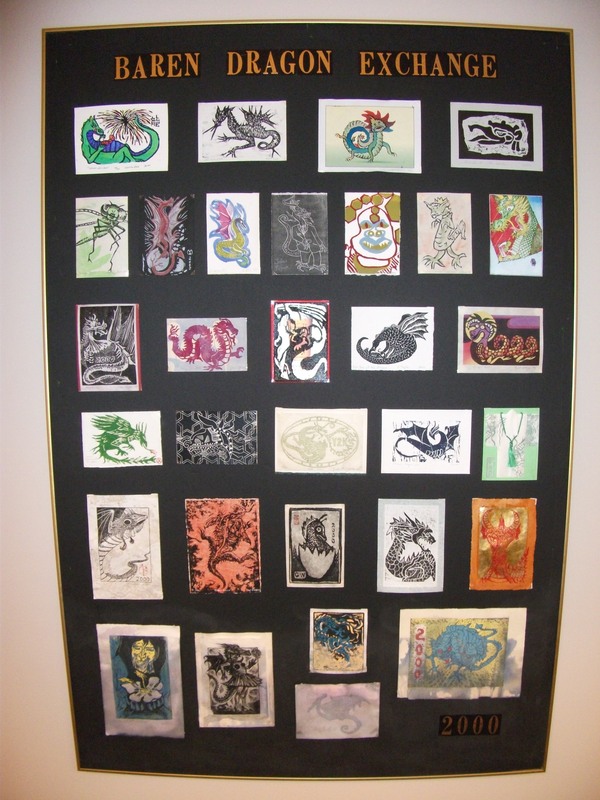 The dragon prints were so well received that they may have found a permanent resting place ! Among the artists represented: Ruth Leaf, Gary Luedtke, April Vollmer, Maria Arango-Diener, Bea Gold, John Ryrie, Sarah Hauser, Jean Eger Womack, Lynita Shimizu, Julio Rodriguez, Andrea Rich, Barbara Mason, Wanda Robertson, Josephine Severn, Jan Telfer, Phillip Smith, Sylvia Taylor, Jack Reisland, Gayle Cline Wohlken, Horacio Soarez-Neto, Arafat AL-Naim, David Mohallatee, Le Green, Jean Norman Chase, Daryl DePry and others. Four Michigan artists will have their time and talents displayed at the Shiawassee Arts Center this season. Linda Beeman, Jane Cloutier, Janet Baugher and Cindy Evans will display their artwork Sept. 20 through Nov. 20. An opening reception will be held 6-8 p.m. Sept. 23, where guests will have the opportunity to meet the artists and see the artwork they are selling. Multiple Impressions is organized by the University of Michigan Museum of Art with the cooperation and support of the China Academy of Art, Hangzhou, China. The 114 works on view by 41 of China's leading contemporary printmakers showcase the extraordinary innovations, both in technique and conception while providing an important framework for understanding both contemporary art from China and contemporary Chinese society. A few years back I wrote on Baren about one of China's premier printmakers...Liao Shiou-ping. Earlier this year, Taiwan’s Council for Cultural Affairs awarded graphic artist Liao Shiou-ping one of three National Cultural Awards. The 74-year-old artist, renowned for blending Western printmaking techniques with traditional Taiwanese and Chinese influences, was recognised for his outstanding contribution to Taiwan culture. Click here to read an article celebrating the artis's accomplishments. To visit a retrospective website with many images and writings click on the image below. Cleveland artist Mabel Hewit, whose work is the subject of a delightful summer/fall exhibition at the Cleveland Museum of Art. Born in Conneaut in 1903 and raised in Youngstown, Hewit, who died in 1984, spent the last 50 years of her life in Cleveland and Parma, where she produced dozens of colorful prints redolent of small-town and city life during the Great Depression and the decades that followed. 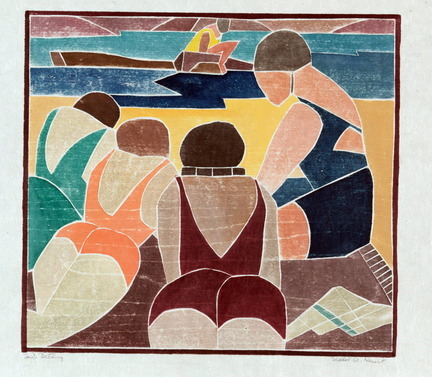 Hewit learned from West Virginia native Blanche Lazzell, a leading practitioner of white-line woodcut technique, who gave instruction in her studio in Provincetown, Mass., during the 1930s. The exhibition's catalog, which presents original research by Jane Glaubinger, the show's organizer and curator of prints, states that Hewit must have studied with Lazzell in 1929, when she visited Cape Cod to attend a class in outdoor painting sponsored by Teachers College, or in the summer of 1933. Judging from a 1934 color woodcut, in which Hewit closely emulated a similar work by Lazzell, the latter's influence was profound and lasting. Continue reading "Mabel Hewit (1903 - 1984)"
Let's go back in time and see what commercial printing was like 60 years ago ! These are vocational films going back to 1947 !!! "Edge of the Bamboo Forest"
Anybody is free to browse these entries and to post comments (a posting form is located at the foot of each entry ). Posting a new entry is a privilege extended to registered BarenForum members only. First time here? Read this message. Tsukasa Yoshida Year of the Ox print. Ukiyoe-Printing using a Vandercook Press. Kyoto printmaker - Mamoru Ichimura. Paul Binnie - latest print "Inazuma" (Lightning). Bill Ritchie & Halfwood Press Studios. Keizaburo Matsuzaki printer - the Art of Utamaro. Follow the following links to Baren members Printmaking related blogs.